As regular readers will know this year I have been cutting down on competition and trying to do those things that I’ve never been able to do because competition has gotten in the way. Now I’ll confess that lot of those things have been food related but some are actually linked to BJJ travel and training, including finally attending a BJJ Globetrotters camp! BJJ Globetrotters is a well established concept within the BJJ Community led by the BJJ Globetrotter himself Christian Graugart. You can find out more about the concept, his journey and how it all began by visiting his website but also by downloading a free copy of the BJJ Globetrotters book (which is well worth a read and recommended in an earlier blog!). 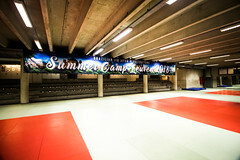 This years summer camp featured 270 grapplers for six days training with over 25 instructors including Christian himself, the fabulous Chris and Melissa Haueter (who I adore training with at the Garage) and my lovely Judo Coach Sophie Cox who was travelling in for the last few days of the camp. So what happened when a Minion met the Globetrotters…. 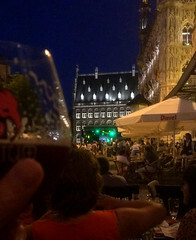 Leuven itself is about a 15 minute train ride from Brussels making it easy to get to from a host of destinations. The camp was held at its traditional venue the “Sportoase”. Essentially its a large multi-purpose sports facility with an enormous matspace (450m2) cover in lovely thick judo mats. The schedule for the camp was action packed with a full 6 days worth of seminars, classes and open mats. In total, 53 hours of BJJ fun was available during the camp so you won’t be surprised to hear that I ended up with out own spreadsheet to plan our week. Mentally for my own planning obsession but also so make sure we fitted in what sessions both me and my hubby wanted to attend whilst balancing the need to stay physically in one piece, eat and do gi laundry! I am not going to write a break down of the technical seminars as that really isn’t the style of my blog plus it would be way more than one post! I attended 2-3 of the technical sessions a day which I think is the right balance of learning new things and not having my brain explode with details! Plus it also enabled me to see most of the instructors and topics I wanted. Luckily to help with retention a lot of the classes were filmed and have been published for free via Globetrotters in Action. Obviously the coaches I mentioned above were awesome but I also had a session of game changing pressure passing gold with Fran Vanderstukken (who also trains out of Brasa Team in Leuvan with fellow camp coach Wim Deputter), got some lovely x-guard details with Thibaut Olivier, bow and arrow goodies with Hillary VanOrnum and lapel trickery with David Morcegao and Aaron Ross. Off the mats this year there were also a variety of seminars and classes. I didn’t make any of theses session much to my disappointment but they just clashed with other things. 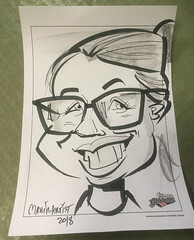 But I did take advantage of the free caricature service and photo booth which were awesome touches. Along with the camp chill out area of hammocks and bean bags which were perfect for in between class power naps and catch up with people! The costs – The camp itself costs 239 euros each (approx £210) which considering the quality of the planning, the quality of instructors and the amount of training available was incredible value for money. As a university town (outside of term time) there is a range of accommodation available to suit every budget. There is also a range of affordable flights (and the Eurostar) from the UK. Food – We didn’t take advantage of food package which was available for an additional 150 euros and included three meals a day as there was plenty of food options available. But we did eat at the sports centre on a couple of occasions (plus multiple coffees) and it was really nice (so don’t be afraid to grab lunch there!). Although I would say take lots of water! The tap water in Belgium is drinkable which makes this task easier but the sports hall does get really really warm. Despite the industrial fans its very easy to overheat and dehydrate. 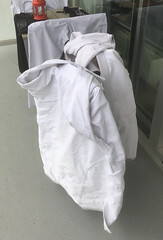 Kit / Laundry – The camp is nicknamed “Laundry Camp” for a good reason. Our Airbnb had a washer in it but there are laundromats across the city that are open till late to squeeze in all those gi washes! You could get away with two gi’s for the trip (one for wearing whilst one is drying) but I found three gi’s to be the sweet spot when travelling. Overall I had a fabulous week away and I could spend ages boring you all about it! 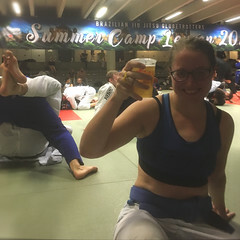 Simply put whether your travelling as a couple (like I was) or individually I would totally recommend trying out one of the many BJJ Globetrotter Camps held around the globe. We’re already considering if we can squeeze one into a our plans for next year! You can get involved as much or as little as you would like to and it really has a great inclusive environment and feel. It’s not just about learning more BJJ but having fun with like-minded grapplers – even if your totally anti-social you’ll still come off the mats catching up with old friends and social media acquaintances as well as with a few new friends! So if you thinking about attending a camp, just do it! This was a great post. I’m considering attending one of their camps in 2019, hear nothing but great things!